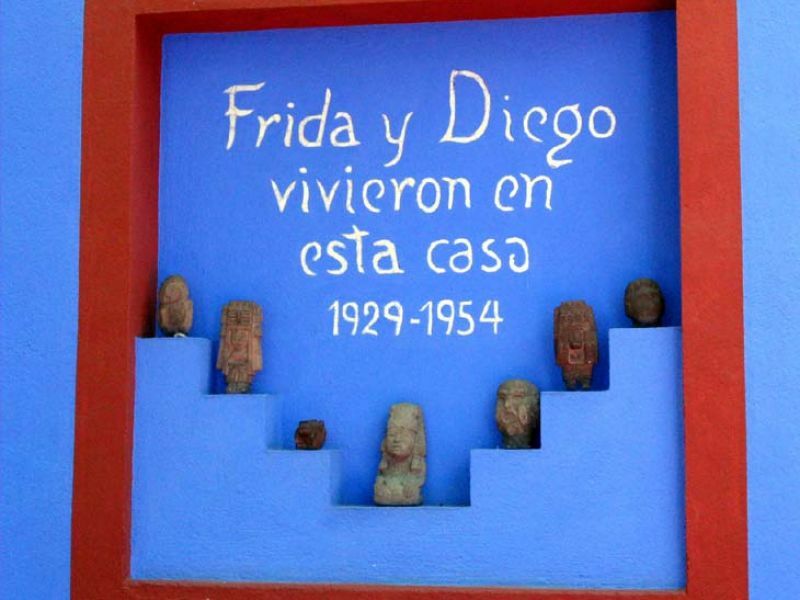 Watch Christie's video of the Frida Kahlo Museum Casa Azul (Spanish). Check out this link for a virtual visit of the Museum. 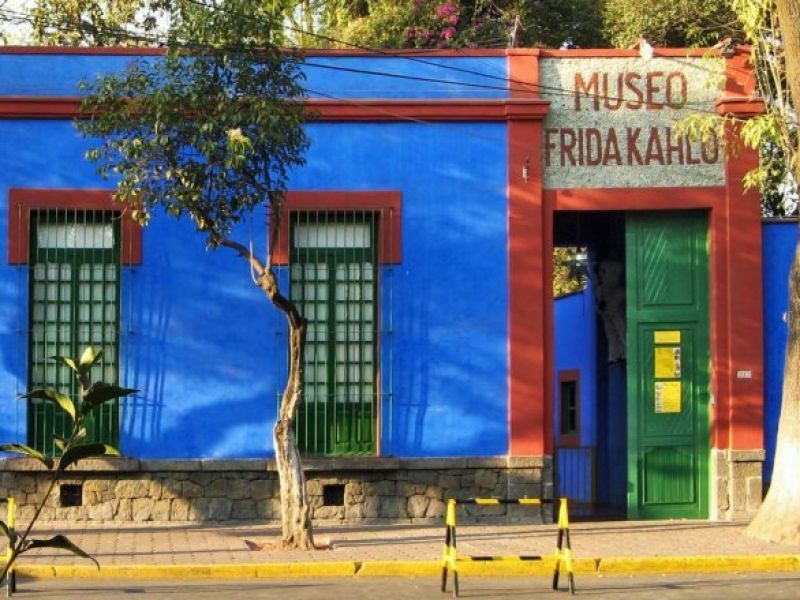 Hidden behind high cobalt blue walls at the corner of Londres and Allende in this charming southwestern suburb of Mexico City, the museo is where Frida Kahlo was born, grew up and later lived with her muralist husband Diego Rivera, from 1941 until her death at age 47 in 1954. Fascinating not only for the collections and personal effects of the two great artists it contains, the museum also affords a window on the lifestyles of affluent Mexican bohemians during the first half of this century. The colonial-style house, a.k.a. the Casa Azul, forms a U-shape around a verdant central courtyard. This cheerful space populated by pre-Columbian idols and luxuriant tropical plantings, is where Frida romped as a child and later as an adult worked on her paintings and held art classes for her "Los Fridos" students. Off the courtyard, the first room one enters is the formal living room, a place where the Riveras entertained their international and eclectic set of friends, including Sergei Eisenstein, Nelson Rockefeller, George Gershwin, the Russian emigre Leon Trotsky, caricaturist Miguel Covarrubias and actresses Dolores del Rio and Maria Felix. Now it's a gallery where some of Kahlo's paintings can be seen, including paintings of her family and her last work, Viva la Vida, a vibrant still life of watermelons.Other rooms contain her colorful Tehuana costumes and pre-Columbian jewelry, her diary, masks, more idols, and giant papier-mache Judas figures, monsters traditionally filled with firecrackers and exploded on Sabado de Gloria, the Saturday before Easter. Also on display are paintings by Rivera, Paul Klee, Jose Maria Velasco and the couple's friends Marcel Duchamp and Yves Tanguy. A large black and white reproduction of "The Two Fridas," painted during the Riveras' short-lived divorce in 1939 (they remarried a year later) can be seen in the house. (The original is in the Museo de Arte Moderne in Chapultepec Park, Mexico City.) The Casa's sparkling dining room and kitchen are pure Mexicanista. Its floors painted a bright insect-repellent yellow, the dining room sports papier-mache Judas skeletons hanging from its ceiling, a long yellow table and cutout yellow dressers holding ceramic animals and traditional green and brown Mexican dishes. Here luncheon guests might find themselves in the company of one or more household pets--Fulang Chang, a beloved spider monkey, or Bonito the parrot, who'd perform tricks at the table for rewards of pats of butter. Conveniently for the 300-lb. Rivera, who possessed a gargantuan appetite, the master bedroom was located off the dining room. His hat, jacket and work clothes still hang from a wall rack. Upstairs in a separate wing Rivera later built for Frida are her bedroom, a library, and her studio. A painted plaster corset she was forced to wear to support her deteriorating spine presides over her bed, and under the canopy is a mirror which enabled her to paint her many self portraits. Above the headboard is a painting of a dead child (Frida was unable to bear children) and at the foot of the bed a photo assemblage of Stalin, Lenin, Marx, Engels and Mao (both Riveras flirted with communism). Always the sentimentalist, and fearful that she just might not be remembered, Frida's embroidered pillow reads, "Do not forget me, my love." In her airy studio overlooking the garden, her wheelchair is drawn up to an unfinished sketch of Stalin at an easel purportedly given her by Nelson Rockefeller.